May is Mental Health Awareness Month! Many patients battling sarcoidosis and other chronic illnesses know the stress that comes not only from the disease itself, but also from juggling the countless doctor’s appointments, symptoms, treatments, side effects and more. Sarcoidosis can put a strain on much more than your physical health- it can cause financial challenges, put strain on relationships with family and friends, and more. It’s easy to feel overwhelmed, no matter if you were just diagnosed with sarcoidosis or if you’ve fought the disease for years. 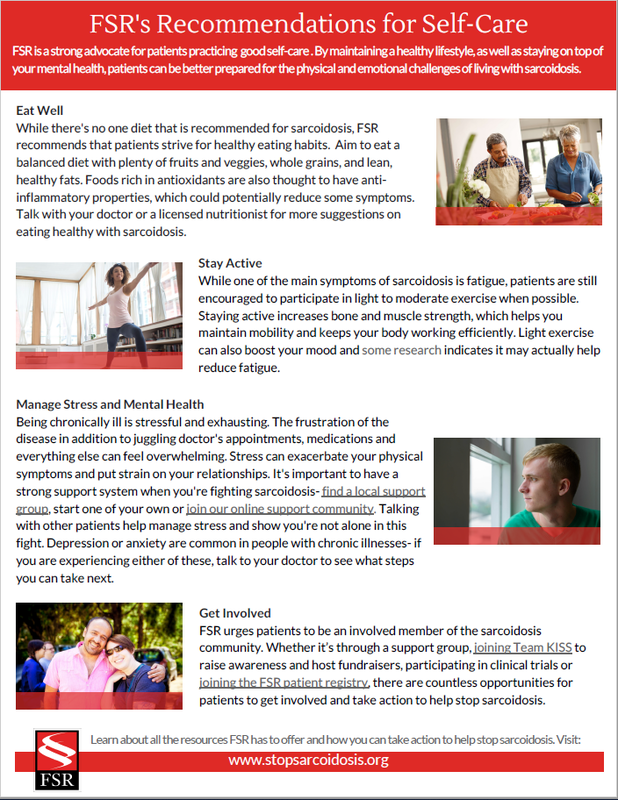 We put together a guide of our best self-care tips to help ensure you’re prepared for whatever sarcoidosis might throw your way. Check out the guide below, also available on our Resources page with other on-demand educational content!